Anthony is also widely invoked for the return of lost articles. This belief comes from a story that told of a novice who ran away, taking with him a book of Psalms which Anthony had been using. Anthony prayed for the return of the book and the novice, struck by an alarming vision, brought the Psalter back to Anthony. St. Anthony is the patron of many things and places besides lost articles. Among them are American Indians, expectant mothers, and sailors. His memorial is celebrated on June 13. Anthony's message today: Anthony has been a favorite saint for hundreds of years because of the belief that he intercedes with God on behalf of many who have lost articles. 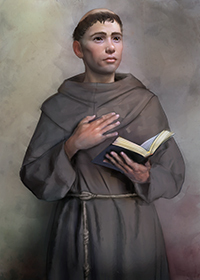 Any Catholic who has, say, misplaced the car keys and said a short prayer to St. Anthony can tell you how they “miraculously” found their keys virtually “under their noses.” We can count on the saints to help us, knowing that they, too, experienced many of the difficulties we encounter in our own lives. Is there a special need that you have at this time that may be helped by the intercession of a saint?